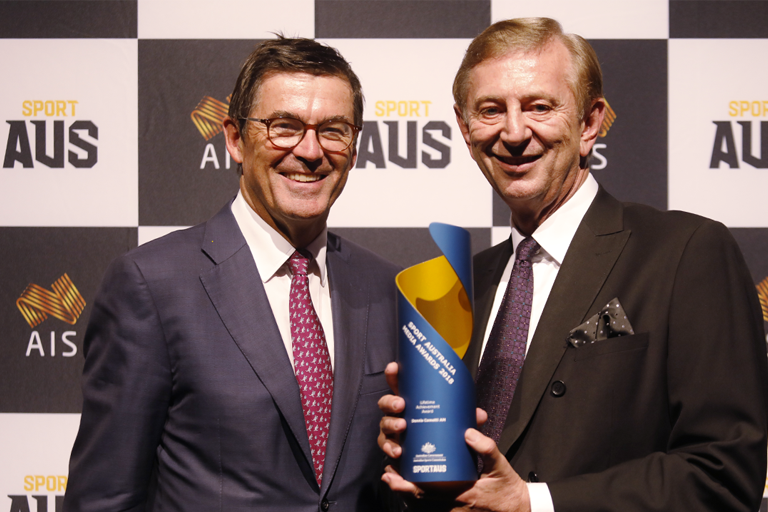 Almost 200 guests attended the Sport Australia Media Awards, with Cometti’s honour the culmination of 14 awards presented at the gala ceremony recognising the best in Australian sports media. “Dennis’ iconic voice has been the perfect match for so many unforgettable sporting moments - Olympic gold medals, Test match cricket and AFL grand finals,” Wylie said. “Trust is a big thing in broadcasting and I don’t think I trusted anyone more than I trusted Bruce,” Cometti said. “I’m honoured to receive an award like this. Obviously its recognition for myself and my family but also my employers and all the people I worked with along the way. My first Test match broadcast for the ABC was in 1973. I was 24. I was broadcasting alongside the likes of Keith Miller, Lindsay Hassett and Alan McGilvray. I had to pinch myself. Previous Lifetime Achievement Award winner Bruce McAvaney relives a few memories with 2019 inductee Dennis Cometti. Winners at the 2018 Sport Australia Media Awards.